The Da River Honeymoon Bay is one of the most famous spots for surfing in Taiwan. Popularly known as the Daxi Honeymoon Bay, this shore line is the only sandy rock beach in the northern part of Taiwan of about 500 meters long. It is shaped like an eyebrow with its northern and southern edges full of rocks and a beachfront perfect for water-related activities. Da River Honeymoon Bay has become a popular surfing spot precisely because of its waves that break at three points, the right, middle and left, making plenty of space for surfers to choose their spot. During the peak season, surfers can go up to 200 people at a time. Waves at the Honeymoon Bay are known to be best during the Winter season as they come fast and in barrels. 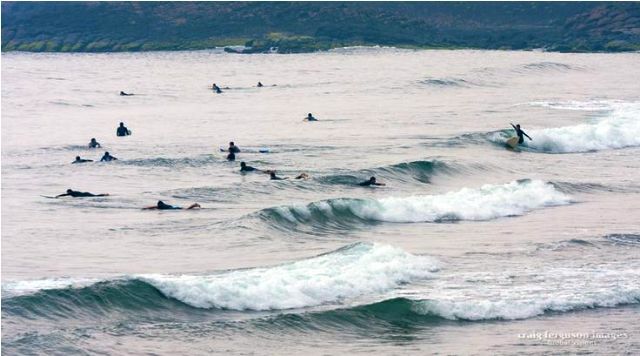 While waiting for the perfect wave, surfers can admire the beautiful and rustic scenery of the Guishan or Turtle Mountain from the shore. For others who are not into surfing, swimming, fishing and scuba diving can be arranged as well. To get to the Honeymoon Bay, take the east-bound train headed to Yilan or Hialien. There is only one local train stop in Daxi so make sure you depart accordingly. Getting to Daxi from Fulong would only take about 10 minutes by train. Make sure to check the local train schedule so you won’t waste your time waiting for the train. Locals claim that waves were even better a few years back compared to today. Apparently, its undersea topography has changed due to unknown reasons, making waves unstable and even dangerously unpredictable. This renders it a great challenge even for expert surfers. Surfing can be a tiring sport, which is why restaurants found near the Daxi station are ready to fill hungry surfer tummies. Two seafood restaurants serve delicious Chinese cuisine that is mostly fresh seafood but for those on a budget, the Vietnamese restaurant offers affordable dishes that can satisfy any appetite. When visiting the Honeymoon Bay, you should watch out for broken glass, sharp gravel, and deadly puffer fish along the beach. One of the potential drawbacks of the shore is its littering problem. Make sure to never walk barefoot along the beachfront so as to avoid getting injured. Now aside from being a prime surfing destination, Daxi is also famous for its fish market at the Daxi fishery harbor. The market is found along a street right next to the Family Mart near the local train station. The best time to visit the market is during late afternoons when fishing boats would return to the harbor with freshly caught seafood. See representatives from the most famous seafood restaurants in town join in on the auction to get their hold on some of the freshest seafood. Make sure to have your share of goodies as well such as oyster omelets, fried oyster cakes and squid thick soup. You’ll know you’ve gone to the right place when you see surfing shops aligned on the shore. There are 3 surfing shops at Daxi that all provide surfboard renting, surfing lessons and accommodation. Simply walk 5 to 10 minutes along the jetty behind the surfing shop to reach the famed surfing spots of the Da River Honeymoon Bay.